In 2014, we set out on an earnest search for a corn tortilla with exceptional flavor and integrity. 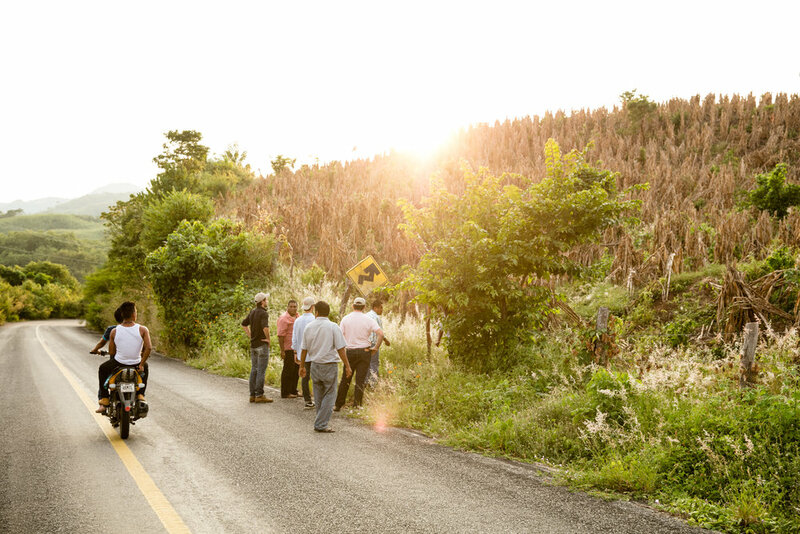 Our quest took us to Oaxaca, Mexico, where we met farmers whose families have been cultivating traditional maize for centuries. It was there that we experienced our first perfect, true tortilla. With each stack of tortillas that we passed and savored, the connection became increasingly clear: genetic diversity, regenerative farming and time-honored technique consistently yielded a dynamic, delicious range of flavors, textures and culinary applications from which to choose. We soon started collaborating with these farming communities, sharing their heirloom corn varieties and traditions with top restaurants around the world. Masienda was born. Today, Masienda proudly partners with hundreds of traditional farmers to grow, source and offer the highest quality single-origin ingredients. We continue to collaborate with chefs to develop in-house, specialty masa programs for their restaurants, while also working to create thoughtful resources, tools and value-added products to lead a new standard for masa quality, preparation and consumption. We believe that the best-tasting food is achieved through a relentless support of agricultural biodiversity, sustainability and independent farmers. With this philosophy in mind, our mission is to build a new kind of masa value chain, from scratch. What’s masa? The dough produced from nixtamalized, stone-ground corn (i.e., maize, the grain kind—not the sweet corn we’re used to eating on the cob) that transforms into hundreds of Mesoamerican food staples, including tortillas, tostadas and tamales. Nixta…what? Nixtamalization (nix-ta-ma-li-za-tion) is the ancient, Mesomerican process of steeping corn kernels with an alkaline ingredient (e.g., slaked lime, ash, etc.). This process softens the corn, imparts calcium and activates the essential amino acids and vitamin B3 found naturally in each kernel. Pretty incredible stuff and worth trying out, yourself, if you ask us. For helpful, easy-to-follow tips on nixtamalization and masa preparation, check out Nixtamal: A guide to masa production in the United States. Why masa? Sounds niche, no? The masa industry is, in fact, a juggernaut. For example, Gruma, the masa behemoth behind Maseca, Azteca Milling, Mission and Guerrero, grossed $3.7 billion in 2017, alone. What’s more, within the last 50 years, the industry’s vast but hyper-consolidated value chain has relied on environmentally damaging agricultural systems and commodity blandness to stake its market and cultural dominance. As consumers, ourselves, hungry for a holistically-deeper connection to our food, we saw an opportunity to do things differently. What does Masienda mean? Masa (see above) + Tienda (“store”) = Masienda. What is heirloom corn? An heirloom is something of value that has been passed down across multiple generations. In this case, heirloom corn comes from farmer-preserved seeds that have been hand selected for the best flavor and maintained for hundreds (even thousands) of years. Each generation does its own part to further perfect the corn’s flavor and quality before it’s passed on to the next generation. Heirloom corn is totally different than the hybrid corn that makes up 99.9% of what is grown in the US (including virtually all organic corn); it is 100% farmer owned and exists outside of the large-scale value chains that we associate with genetically-modified corn, cattle feed and ethanol. Think of it as expressly culinary, not commodity. Is the corn non-GMO? Organic? Yes, all Masienda corn is non-GMO (it’s technically illegal to grow genetically-modified corn in Mexico!) and grown with a diversity of regenerative practices. Unlike conventional treatment of non-GMO grains across the world, no pesticides or fumigants are used at any point in Masienda’s post-harvest handling. Why isn’t the corn certified organic, then? While some growers and cooperatives are large enough to justify organic certification (and are indeed certified organic), the truth is that it can be a prohibitively expensive proposition for the scale of farmers with whom we work. The average Masienda farming partner independently manages around 5-10 acres of land—for comparison, the average family farm in Iowa is 351 acres. That said, we are incrementally working to support several of our partner communities’ and cooperatives’ efforts to completing third-party organic certification. How are the farmers treated and paid? Is it fair trade? Masienda is the first to create a premium, scalable market for surplus corn grown by smallholder subsistence farmers in Mexico. Masienda concentrates its efforts in communities living below the international poverty line, where it can maximize economic impact for at-risk families and the rare varieties they grow. Market demand permitting, those farmers who opt to participate are able to do so at no risk, whatsoever. A radical departure from the informal “coyote” systems that (at best) take farmer surpluses on consignment, payment is immediately issued to farmers, following product quality evaluation. Premiums reach between 2x to 5x more than farmers would otherwise command for hybrid, commodity grain. Masienda has historically determined its purchase pricing with the input of third-party agencies, community-supported non profits and foundations. Pricing is assessed in the immediate weeks leading up to each harvest cycle. Masienda weighs a wide spectrum of factors affecting farmers and production, with considerations ranging from crop yields to currency exchange and varietal scarcity. Demand permitting, Masienda opens its aggregation season one month after harvest takes place in a given region. This window is intended to provide enough time for farmers to collect and sort materials for surplus, if any. All transactions are documented through a written contract, which certifies price, surplus declaration (i.e., check against sale of subsistence crop), weight (in order to document/track against historical index within a given community/for a particular farmer), etc. Farmers are then paid directly and immediately, according to previously determined price index, after weight has been measured, pathogen testing performed and any rejected materials have been returned. So, while Masienda appreciates the work that fair-trade certifiers have done to raise awareness and standards for equitable markets, the idea of spending several (more) years begging to pay tens of thousands of dollars for certification from these agencies hardly qualifies as a constructive use of our time or resources. Instead, we will continue to refine our standards and lead the way for responsibly sourcing and commercializing identity-preserved corn in economically disadvantaged communities. We take solace in knowing that we’re not alone in blazing our own fair-trade path. Companies such as Counter Culture Coffee have created thoughtful, impactful sustainability models in developing communities across the world. If your focus is masa, why the beans and hibiscus? We support these traditional companion crops to corn because they encourage holistic sustainability, promote soil health and create additional offtake opportunities for the farmers with whom we work. Jorge has trained at top restaurants, including Danny Meyer's Maialino and Dan Barber's Blue Hill at Stone Barns. He now subsists almost entirely on tortillas and scrambled eggs. Danielle has worked in dynamic roles across the natural and organic sector, including training and education at Whole Foods Market and operations at Belcampo. She is the hyphen in farm-to-table sourcing and is especially fond of green chile enchiladas. Darien developed his impeccable sense of hospitality and attention to detail at two of the world's best restaurants – Eleven Madison Park and Blue Hill at Stone Barns. Tostadas and fresh guacamole are, hands down, his favorite meal. Our humble but hungry Los Angeles-based team would be nothing without its countless partners and advisers on both sides of the border.